The attention of the world has been caught and held by the wireless telegraph, and yet this is a very primitive use of the art. So far only electric waves have been used, which have been quickly damped out in their passage through the air. It is possible, however, to transmit electric currents of enormous power for thousands of miles without diminishing their energy. This is not a theory, but a truth established by many practical experiments. It will soon be possible to transmit wireless messages all over the world so simply that any individual can carry and operate his own apparatus. The wireless transmission of power across the ocean, for instance, obviously opens up an entirely new era in mechanical developments. It will soon be possible, for instance, for a business man in New York to dictate instructions and have them appear instantly in type in London or elsewhere. He will be able to call up from his desk and talk with any telephone subscriber in the world. It will only be necessary to carry an inexpensive instrument not bigger than a watch, which will enable its bearer to hear anywhere on sea or land for distances of thousands of miles. One may listen r transmit speech or song to the uttermost parts of the world. In the same way any kind of picture, drawing, or print can be transferred from on place to another. It will be possible to operate millions of such instruments from a single station. Thus it will be a simple matter to keep the uttermost parts of the world in instant tough with each other. The song of a great singer, the speech of a political leader, the sermon of a great divine, the lecture of a man of science may thus be delivered to an audience scattered all over the world. More important than this, however, will be the transmission of power without wires over great distances. I have been experimenting with a model of a boat operated by electric power transmitted without wires, and the results are astounding. It is possible, I find, to control the movements of the boat absolutely from a central station without electrical connections of any kind. What has been done with a little boat on a small body of water will eventually be done by the largest liners at any distance from land. In other words, an ocean liner may be propelled across the Atlantic ocean at high speed by power directed from a wireless station on shore. We may confidently expect that within a few years many wonder now not dreamed of will be mere commonplace. The mobile radio telephone Tesla envisions sounds like a simple, but powerful, radio transceiver — only impossibly small with the pre-transistor technology of Tesla’s day. In fact, the whole idea is not particularly practical with today’s technology either, until you introduce a cellular network, and most of what characterizes a Blackberry isn’t the radio so much as the miniature computer — a technology Tesla did not predict. Instead, he predicted wireless power transmission. It turns out that it’s much, much easier to transmit information over the ether than significant amounts of usable energy. By the way, that image of Tesla is of David Bowie playing Tesla. His papers suggest he stumbled upon — but didn’t pursue — lasers and X-rays, years before their recognized discoveries. He proposed transmitting electricity through the upper atmosphere. 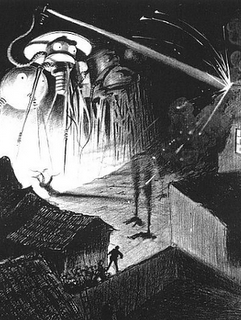 He sketched out robots and a death ray he hoped would end all wars. Tesla’s more outlandish pronouncements stoked that mythology. He said he could use electricity to cause earthquakes and control weather. He claimed to have detected signals from Mars while he was in Colorado. This consists of a means of generating electricity in one spot, where it can be done with little cost, and transmitting the electricity to some other spot where it is impossible to generate electricity except at a big outlay of money. Of course, it is now possible to transmit electrical power from one place to another by the use of electrical cables, but the cost of these transmitting cables is nearly as great as would be the cost of generating the electricity itself in the locality to which it is desired to transmit it. By the use of Tesla’s invention, the atmosphere takes the place of the electrical cables in the transmission of the power, and as the use of the atmosphere would be free, the cost of the transmission ofelectricity from one city to another would be merely nominal. The second part of the Tesla plan for transmitting electrical power without wires calls for the erection of receiving stations wherever desired. These will act as sort of receivers and storage houses for the electricity set free into the atmosphcre at the generating station miles away. Over each of the receiving stations will be put up a tower and a balloon, which will be equipped with the apparatus necessary to absorb the free electricity in the atmosphere and send it to the receiving station below, from which it can be sent out on wires to light the surrounding country and drive all the machinery of that particular district. I have more faith in his plans for wireless telegraphy. That seems like a winner. The last snip of Con Ed’s direct current system will take place at 10 East 40th Street, near the Mid-Manhattan Library. That building, like the thousands of other direct current users that have been transitioned over the last several years, now has a converter installed on the premises that can take alternating electricity from the Con Ed power grid and adapt it on premises. Until now, Con Edison had been converting alternating to direct current for the customers who needed it — old buildings on the Upper East Side and Upper West Side that used direct current for their elevators for example. The subway, which has its own converters, also provides direct current through its third rail, in large part because direct current electricity was the dominant system in New York City when the subway first developed out of the early trolley cars. But direct current clearly became uneconomical, as the short distances that it could be transmitted would have required a power station every mile or less, according to Joe Cunningham, an engineering historian. Thus alternating current in New York began in the outskirts — Queens, Bronx, Upper Manhattan and the suburbs. Tesla’s AC eventually won the “war of currents” over Edison’s DC because the efficiency advantages of high-voltage transmission could only be achieved at the time using the AC transformer to step up the voltage from the generator to the grid, and then step it down again from the grid to the users. However, technological developments in the last century have enabled high-voltage DC power transmission, which can actually achieve greater efficiency and lower equipment costs in some cases, mainly long-distance runs which don’t require intermediate taps, and undersea cables.